In 1993, then Detective Matt Peterson of the Long Beach Township Police Department, under the direction of Chief James Hartmann attended the D.A.R.E. Officer Training Course, an extensive eighty-hour training course that ranges from educational philosophies to drug recognition. After Sergeant Peterson initiated the program, Patrolman Kevin Lyons was sent to the training in order to assist Sergeant Peterson. Today, Community Police Officer Megan Keller (Officer Megan) and Patrol Officer Sean Ferguson (Officer Sean) administer the program in the Long Beach Island Grade School and the E.J. School. To help fund the D.A.R.E. 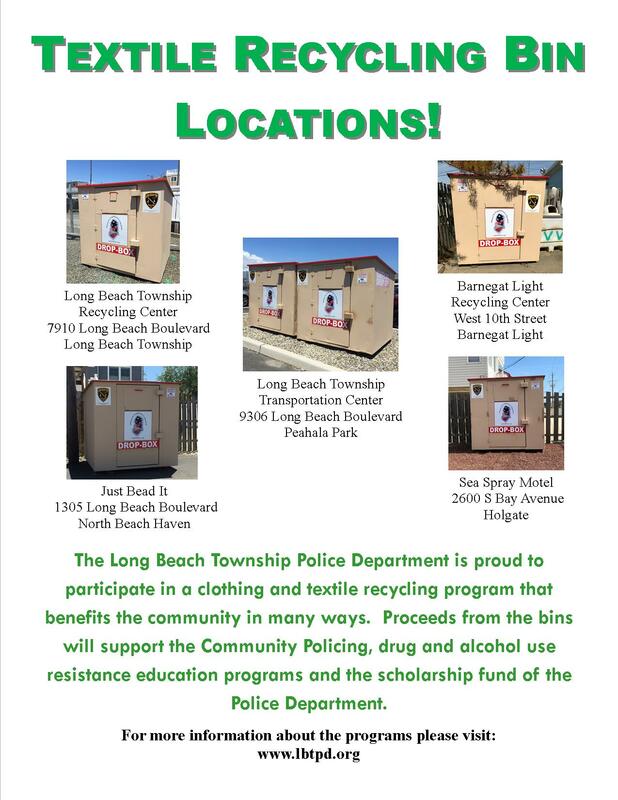 program in the schools, Long Beach Township Police Department teamed up with Textile Recovery Services, Inc., a textile (clothing, shoes, etc.) recycling bin company. See below flyer for more information. Every year on Long Beach Island, our 7,500 year-round residents are joined by about 140,000 seasonal residents and visitors from late June to early September. While nearly every demographic vacations in Long Beach Township, it is inevitable that our Police will encounter underage drinking and underage possession of alcohol during many of their calls for service. In an effort to decrease underage drinking and underage possession of alcohol with other surrounding Police Departments, we have begun to endorse the DART Prevention Coalition. DART is a County-wide program whose goal is to engage youth and residents in the process of reducing substance abuse. For more information do not hesitate to contact Officer Ferguson (609-494-3322 ext. 2428) with any questions or concerns.